Congratulations to Chris Tryba, Winner of Event #35: $2,500 Mixed Hold'em ($210,107)! After three hard-fought days of Texas Hold'em, both in its limit and no-limit formats, Event #35: $2,500 Mixed Hold'em is in the books with Chris Tryba standing tall as champion. Day 1 began with 393 entrants, which was a notable decrease in attendance from last year's event, which brought in 580 entrants. However, despite the decrease, there was no shortage of big names and notable pros in attendance. Among those who showed up for Day 1 included Antonio Esfandiari, Daniel Negreanu, Jeff Madsen, Barry Greenstein, David Williams, Huck Seed, Dan Harrington and the one and only Phil Ivey, who registered late after being eliminated from the $10,000 H.O.R.S.E. event. Of those players, only Ivey, Williams, Seed and Harrington would survive into Day 2, with gold bracelet winner Andre Akkari leading the field. The 87 remaining players would be chopped down to 46 in short order, with Dario Sammartino claiming the unfortunate title of "bubble boy" after being eliminated in 46th place. Dan Harrington soon followed suit after min-cashing in 45th place ($4,229). Most of the remaining big names would fall in the race to the final table, including Williams in 30th ($5,195), Seed in 19th ($6,437) and Akkari in 15th ($10,219). When Day 2 was all said and done, just nine players remained to compete for the gold bracelet in Day 3. 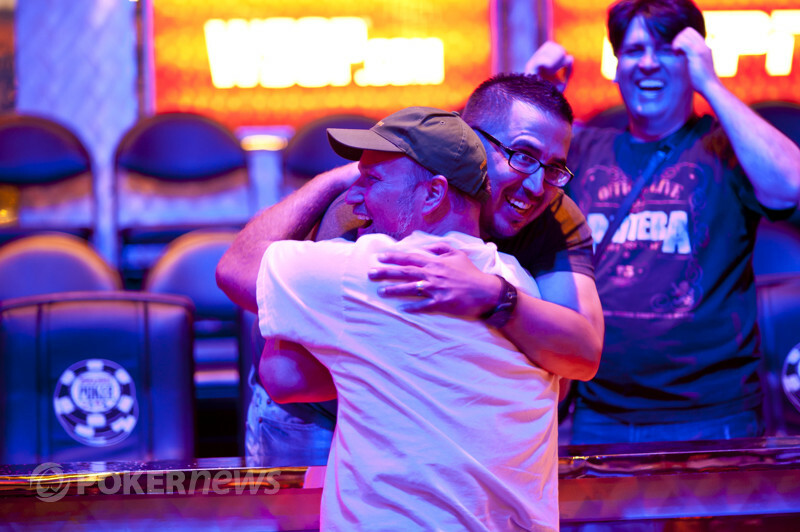 Among them included Day 2 chip leader Joep van den Bijgaart, bracelet winner Michael Gathy and of course, Phil Ivey — who cemented his fifth final table appearance for this World Series of Poker and tied the record for final table appearances in a single Series. The short-stacked Michael Foti would be the first to hit the rail after getting all in preflop with against Cajelais' . The dominated Foti failed to improve and he was eliminated. Next to go would be the man everyone had their eyes on — Phil Ivey. The events leading to his bustout were... unlucky, to say the least. Golbuff dealt the brunt of the damage to Ivey's stack after his rivered a straight against Ivey's after getting all in preflop. Shortly thereafter, Ivey was all in for his last 7,000 against three opponents, who checked all the way down on the board. Ivey held the for a pair of aces, but it was no good against Cajelais' for two pair and Ivey made a hasty exit. 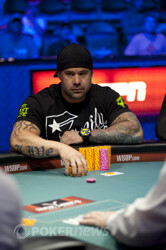 Wheeler exited in 7th place after getting all in preflop with against the of Golbuff. Wheeler was in good shape to double, however, the board ran out ... , giving Golbuff a pair of queens on the river for the knockout. Golbuff wouldn't be able to ride his momentum, however, as he was knocked out in sixth after running his into the of van den Bijgaart all in preflop. The board kept Golbuff second best and he was eliminated. Gathy had a chance to accomplish the rare feat of winning more than one WSOP gold bracelet in a single year, but fell short when his lost a race to Behbehani's after getting all in preflop. Van den Bijgaart had to settle for fourth place despite coming into Day 3 as chip leader. He met his end during Limit Hold'em against Cajelais after getting all in on a flop with against Cajelais' . The turn and river bricked out for van den Bijgaart and he was eliminated. Next up was Behbehani, who was by far the shortest stack going into three-handed play. Behbehani ran into runner-runner trips held by Tryba and was sent to the rail in disbelief in third place. Tryba and Cajelais were both relatively deep going into heads-up play, however, that apparently did not matter as their battle was decided on the very first hand. The game was No-Limit Hold'em and the flop read . Tryba checked to Cajelais from the big blind and Cajelais bet 45,000, which Tryba called. The turn brought a and Tryba check-called a 130,000 bet from Cajelais. A completed the board and Tryba led out for 250,000. Cajelais raised all in and Tryba insta-called and revealed for the nuts — a straight flush. Cajelais held the for an inferior king-high straight and had to settle for a runner-up finish. 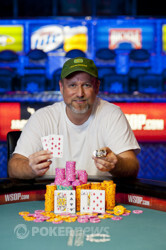 And just like that, Chris Tryba claimed his first WSOP gold bracelet and the $210,107 prize that went along with it. This victory adds to Tryba's already-impressive poker resume, which includes over $1 million in live tournament earnings. On the first hand of heads-up play, Erik Cajelais and Chris Tryba took the flop after Cajelais had raised on the button and Tryba called from the big blind. On the flop, Tryba checked and Cajelais bet 45,000. Tryba made the call. The turn was the and Tryba checked again. Cajelais fired another bet of around 130,000 and Tryba made the call. The river card was the and instead of checking for a third street in a row, Tryba fired 250,000. Cajelais took a minute and then announced a raise. He first put out the 250,000 to call, then thought a few moments more. Then, he announced that he was all in and Tryba snap-called and exploded from his seat, tabling the for an unbeatable straight flush! Cajelais held the for a king-high straight, but was eliminated in second place. Tryba jumped for joy and shouted at the top of his lungs, knowing he had just won the most coveted prize in all of poker, a World Series of Poker gold bracelet. 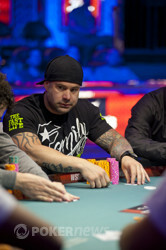 For his finish, Cajelais earned $129,766 and fell just short of earning his second piece of WSOP gold. Chris Tryba min-raised to 40,000 from the button and was three-bet to 105,000 by Salman Behbehani from the small blind. Erik Cajelais got out of the way from the big and Tryba made the call. The flop came and Behbehani under-bet the pot for 65,000. Tryba made the call to see a turn, which brought the . Behbehani led out again - this time for 85,000. Tryba again called. 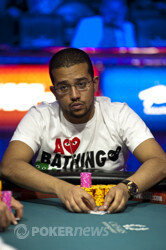 When a completed the board, Behbehani announced he was all-in for his last 300,000. Tryba snap-called and revealed for runner-runner trips. "Jesus Christ...," is all Behebehani could say, revealing for a second-best queens and deuces before heading to the rail. Behbehani will receive $93,842 for his efforts today. Players have taken their seats and cards are back in the air! Our final three combatants are on their second break of the day. Play will resume in 20 minutes. Chris Tryba raised from the button and Salman Behbehani reraised from the small blind. Erik Cajelais four-bet from the big blind and Tryba folded his hand. Behbehani called. The flop came down paired with the . Behbehani checked and Cajelais bet. Behbehani made the call. The turn was the and Behbehani checked. Cajelais bet and Behbehani made the call again. The river was the and Behbehani checked with trip deuces on board. Cajelais fired a bet and Behbehani called. Cajelais tabled the for deuces full of kings and Behbehani mucked his hand. Below are the chip counts going into break. Erik Cajelais made it two bets from the button and Chris Tryba three-bet from the small blind. Salman Behbehani cold-called from the big blind and Cajelais made the call as well for a three-way pot. The flop brought and Tryba led out. Behbehani called and Cajelais got out of the way. The turn brought a and this time, Tryba check-called a bet from Behbehani. The completed the board and Tryba led out. Behbehani reluctantly called and Tryba flipped over for a rivered pair of aces. Behbehani shook his head and mucked without showing. Five Times a Charm For Phil Ivey?